I am going out on a limb here and say that Johnny Gargano's journey to his first NXT Championship (and beyond) is one of the best storylines in wrestling so far. It's crazy how basic the storyline is, yet it is such a delight to watch it unfold in front of us. The cunning Zelina Vega continues to get inside Gargano's head by making it look like NXT General Manager William Regal also doubts the abilities of our protagonist. Johnny Wrestling has had his share of doubters and naysayers, and for the longest time, he just took them all in. This time though, he's had enough. In an excellent promo, Gargano proclaimed that he is not a broken man and a loser, that this is his time and no one is going to stop him. To further prove his point, he put his TakeOver title opportunity on the line in his match against Velveteen Dream next week. He then concluded with "For the first time in a long time, I know who I am. I am Johnny Gargano. I am Johnny Freaking Wrestling!" with so much conviction and at the same time, making it sound like he was also convincing himself. 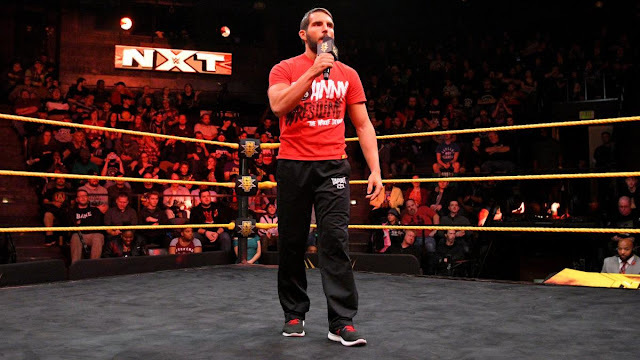 Johnny Wrestling might be fired up and all with the fans behind him, but Nigel McGuinness put it perfectly on commentary: "Maybe the biggest doubt is in Johnny Gargano." Gosh, I love it when wrestling makes me all teary-eyed. -Tino Sabbatelli and Riddick Moss def. Heavy Machinery: This feud was born a few weeks ago when Otis Dozovic tried to lift and move one of of his opponent's cars that was blocking the way. This was an okay opener with a bunch of fun spots, with Heavy Machinery dominating as soon as the bell rang. They were not able to sustain the momentum though, and Tucker Knight ate Riddick Moss' rollup pin with his feet on the rope. Moss and Sabbatelli winning didn't come as a surprise, since they badly need momentum after their feud with Street Profits, where they took the shorter end of the stick. Tucker Knight is a revelation for me here. Aside from being a perfect contrast to Dozovic's cartoonish ways, he's also smooth and agile in the ring. -Roderick Strong def. Fabian Aichner: This is nothing new, but both Roddy and Aichner sure can wrestle, can't they? Just as always, Aichner looked strong despite tapping out to Roddy's Stronghold. Mauro Ranallo kept on reminding fans that Aichner holds a victory over Johnny Gargano, so he's a win away from breaking through. I mean, surely Aichner isn't going to lose forever. After the match, Roddy called out Lars Sullivan, who he said was a “force like something he’s never felt before” that he has to "destroy". Last week, Lars called out Killian Dain. Maybe we're getting a triple threat? As for Roddy's current role, I'm not so sure if an NXT title reign is still in his future. I hope it still is, but I wouldn't be surprised if he puts over either Lars or Killian, if ever that match pushes through. -TM61 is back, mates! The Aussie duo was sidelined in 2017 due to Shane Thorne's knee injury, so reintroducing them through video packages will surely do wonders. As per usual, WWE's production team did a great job, highlighting the things that will get them over with the NXT Universe. They seem to be grooming TM61 as the biggest babyfaces in the tag team division, so that could be interesting. Already cannot wait for the inevitable TM61 vs. Undisputed Era match! -Lacey Evans def. Aliyah: The match was what it was: a setup for Ember Moon to officially challenge Shayna Baszler for TakeOver: Philadelphia, but it's interesting to note that Creative is turning Lacey Evans into a heel who thinks that she's higher above everyone else. In her post-match promo, she called out the "classless" Nikki Cross, the "confused" Ember Moon, and the "pathetic pirate" Kairi Sane, and complained why she, a classy, sophisticated woman, is being overlooked by GM Regal. *Gasp* could we be getting a heel all-American gimmick? Mid-promo, Shayna Baszler came out, and obviously, Lacey didn't want anything to do with her. Shayna added insult to Aliyah's injury and applied a Kirifuda clutch on her. Ember made the save after a while. This is just a small thing, but Shayna and Ember's exchange, personally, was a breath of fresh air for me, because it wasn't done inside the ring. Shayna was at the ramp, talking loudly, while Ember was holding a microphone inside the ring. And they finally got me to root for Ember Moon this time, but I guess it's largely because Shayna's a bully. -Authors of Pain def. Street Profits to become number one contenders to the NXT Tag Team Championship: This was a short match that was dominated by the Authors of Pain, I think there's nothing new about that. Montez Ford powering through Rezar's headlock, and then capitalizing on his mistake to make a hot tag to Angelo Dawkins was my favorite spot. I was honestly expecting more offense from the Street Profits, but I guess the main point of this match was to remind everyone that AOP is the stronger and much bigger team compared to the current champions. We have to wonder if the Undisputed Era will even stand a chance, but hey, it's the Undisputed Era, they will find ways. As for the Street Profits, I really like them a lot, but they're not quite there yet. Setting up another mid-card feud for them is the smartest move right now, while they pave the way for TM61 vs. Undisputed ERA for the next TakeOver. In-ring wise, this week was a bit of a letdown compared to last week's banger of a show, but it hardly mattered because angles and character developments are still compelling. It still made me excited for TakeOver, so this gets a B+.